Als expert word ik uitgedaagd door permanente verandering. When I graduated from university (master Quantitative Finance at the VU Amsterdam), I was looking for a job in which I could apply and further develop my econometric skills. However, I believe that it is also important to develop your soft skills in order to jumpstart your career. Hence, I was not interested in a job where the focus would solely be on building financial models but in which social interaction plays an important role as well. That’s why I started a career in consultancy at Zanders. At Zanders I found an environment where I can develop my financial knowledge on many areas. I currently enjoy a steep learning curve by learning on the projects and following internal and external training. Projects typically start by meeting the client and understanding their problems and situation. This might sound trivial, but in some cases, clients don’t know their problems themselves until you point them out. Therefore, it is important developing skills to interact with the client. The projects I work on are of a quantitative nature. I can put my econometrics and quant finance knowledge into practice. This ranges from projects where we create financial models, such as value-at-risk models or pricing models, to more strategic assignments where we advise clients how they can manage their portfolio or balance sheet to achieve the highest profit for level of risk taken. 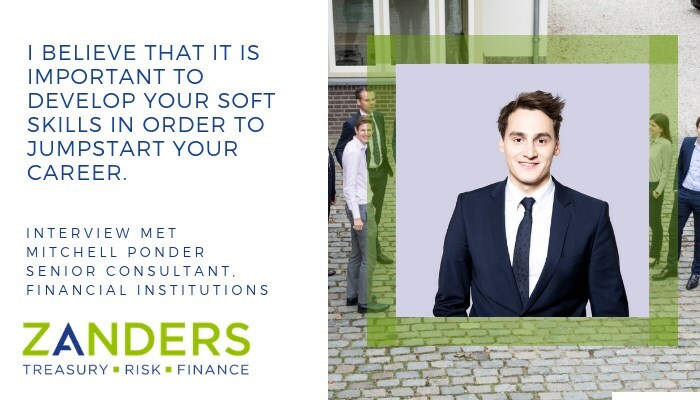 The diversity that the job offers in working on projects at multiple financial institutions, is key to the steep learning curve at Zanders, but more importantly, it keeps the work enjoyable and keeps my motivation high. Next to the work we do for our clients, Zanders provides opportunities for personal development via many internal and external trainings organized throughout the year. As a starter you participate in the Zanders Talent Program and more experienced consultants can obtain their CFA or FRM certificates or follow training in for example presentation skills. These possibilities are a key requirement for me in an employer. Furthermore, it is in the best interest of both parties as Zanders is as good as its consultants! Next to the content of the work, I enjoy the culture and values of Zanders. A good work life balance is recognized, and the flat organization culture is evident in our company. I work with smart and specialized colleagues who are helpful and interested in the work I do. Besides the distinctive characteristics of Zanders, it is a fun company to be part of. Every year we travel with all colleagues to a new location in Europe for the legendary Zanders trip. And many activities are organized by colleagues which range from dinner and drinks to events such as karaoke nights, trail running in The Ardennes and the annual ski trip. I wanted to join a relatively small company which could facilitate a tailor made (personal) development program. For me, it was clear this was the company to further boost my career.